While we're all excited for Android Wear in general, Motorola's Moto 360 has really been the product on everyone's minds since the announcement. Of course, LG has its own thing a-brewin' with the G Watch – while not quite as exciting as the 360 (because round and other reasons), it's still shaping up to be an interesting offering for those who may prefer a square watch face. Today, the company has launched a teaser site of sorts for the G Watch, which reveals some info that we didn't know about it before. 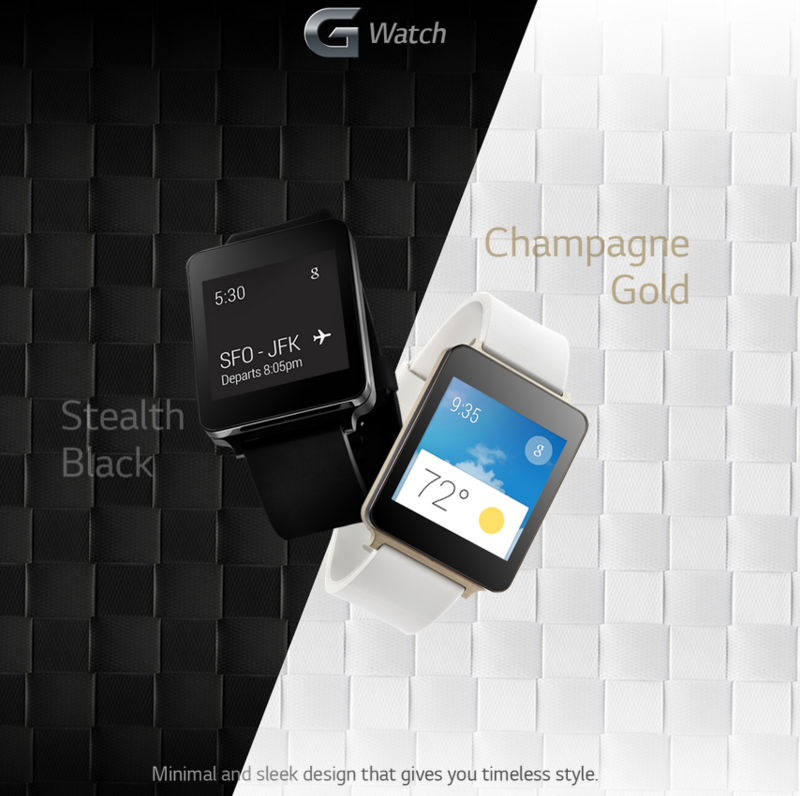 For starters, the microsite highlights the fact the watch will ship with two color options: Stealth Black and Champagne Gold, which LG claims gives the unit "timeless style." Probably not the best choice of words to describe a watch. Both units look to have generic rubbery-type bands, which may detract from the premium look and feel some users are likely after. 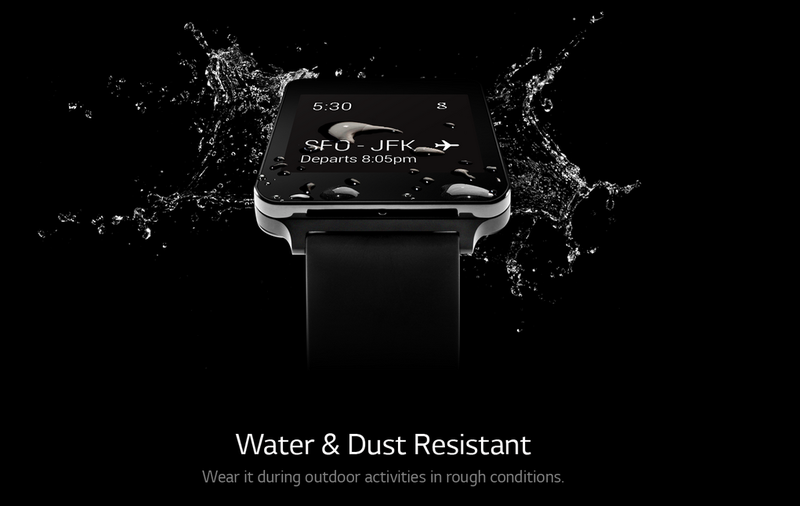 On the upside, however, the watch is both dust- and water-resistant (which could actually explain the lack of a metal band), so it can be worn all the time without fear of ruining it in the shower, swimming, or other water-related activities. 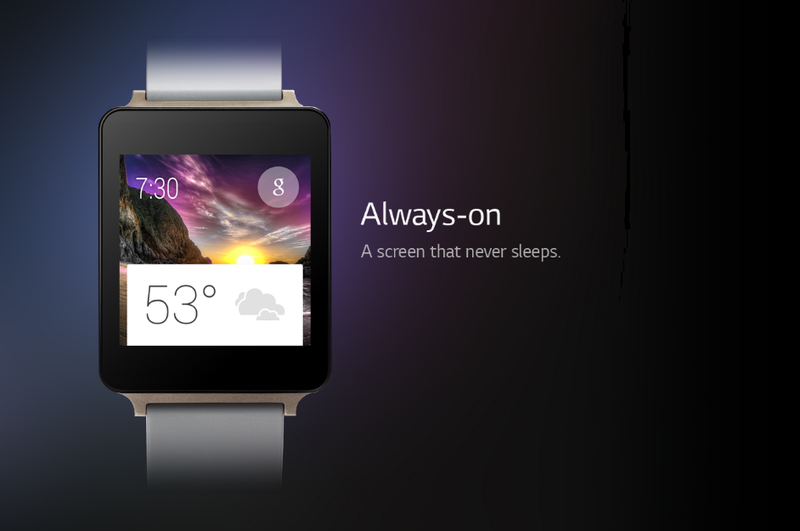 Speaking of always wearing it, LG is touting the G Watch's display as "always-on." This, of course, raises the question of battery life – with a display that never shuts off, the battery drain has to be substantially more than one with one that times out automatically. Perhaps there will be a setting for those who would like the latter option, though that's just speculation at this point. If not, however, I have a feeling this device will be hitting the charger nightly...assuming it can make it through an entire day of use in the first place, of course. I'm skeptical at this point, though maybe LG has some new battery-saving technology up its sleeve that the rest of the world isn't yet aware of. 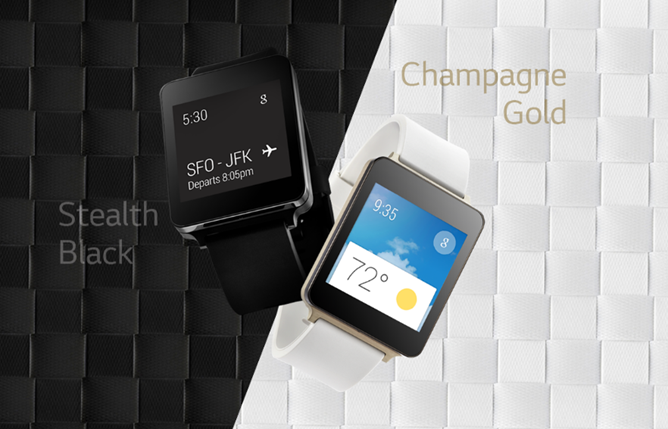 There are several images of the G Watch, which include a couple of generic-ish slides about Android Wear, over at the microsite; if you're interested in this particular wrist accessory, head here to check it out.